As you can see Mike works in all weather conditions! Mike is a very experienced field ecologist with over 20 year’s fieldwork & research experience in the field of ecology. We finally persuaded him to join the Woodrow team in 2015 and he now manages Woodrow’s field workers. An expert Summer and Winter Bird surveyor he has amassed a thorough understanding of Ireland’s avian ecology. Mike is regarded as one of the leading authorities on Chough ecology in Ireland having produced reports detailing the ecology of several regional Chough populations & assisted the in the designation of Special Protection Areas (SPAs) for Choughs. Indeed he was an advisor for the production team for a recent Star Wars movie regarding filming in and around SPAs in Co. Kerry! Other contracts have afforded him the opportunity to study some of the country’s other iconic bird species including Red Grouse, many marine species, as well as the important seabird colonies that adorn the Irish coastline. 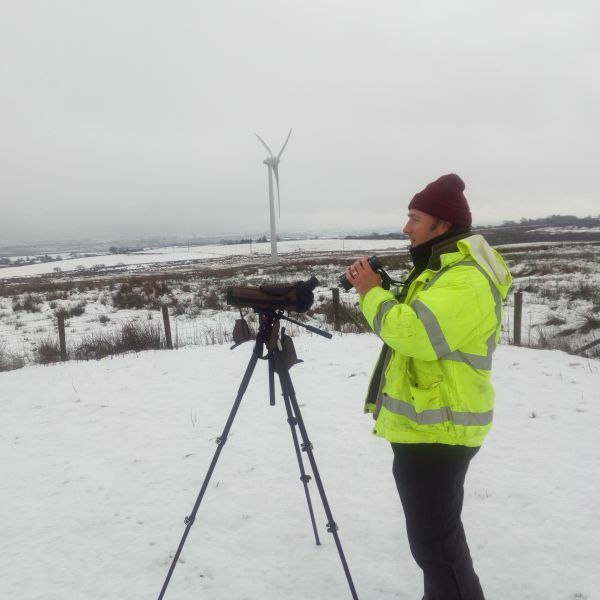 He has been involved with monitoring avian populations in the Midland peatlands areas of Ireland extensively since 2011.